Twinkling H20's are a popular water paint which is used in a wide variety of projects. In this review, we take a look at Twinkling H20's and see how they perform. Twinkling H20's are little cakes of shimmering watercolor paint. The paints are sold in individual pots which are sold either in kits or separately. The paints are available in 156 colors and they can be mixed and blended to create a further pallet of colors. Twinkling H2O's come in two size pots, large (5 grams - regular size) and minis (Little Twinklers). Individual Twinkling H20 colors are available in the large size only. Kits are available with a mix of 6, 12 or 24 of the large size pots. These colors can be used on a variety of surfaces and these include paper and cardstock, wood, plastic, and even eggs - and they are ideal for many altered art projects. Some projects may require sealing when finished. Twinkling H20's are made in America by LuminArte who also manufacture the Primary Elements range of paints. Twinkling H20's can be used in the same way as any watercolor paint and different stampers have their own favorite way to use these shimmering colors. The paint cakes can be moistened and the paint used direct from the pot, or the color can be blended and mixed on a plate or pallet. 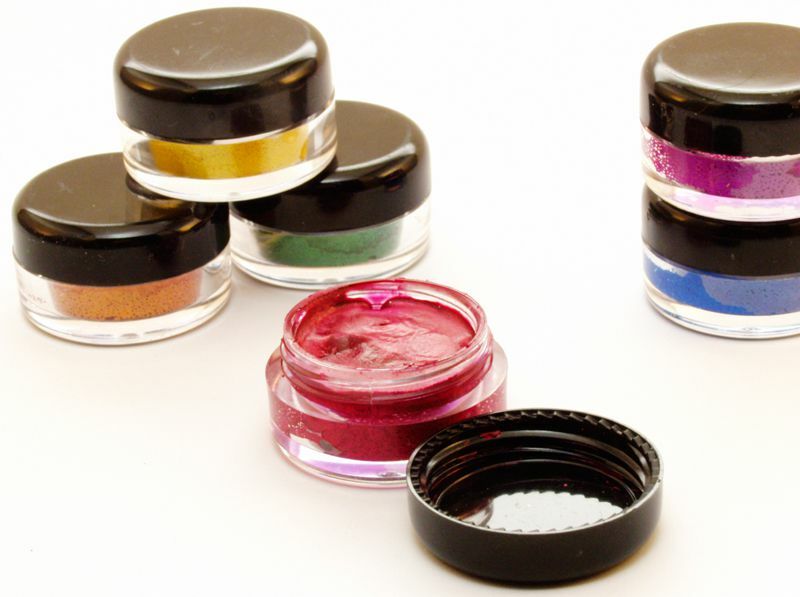 The colors are highly pigmented giving strong and vibrant colors. These can be blended with water for lighter shades. LuminArte has developed a color that is ideal for blending to lighten colors, this is called 'Oyster' and will lighten the color while still keeping the distinctive shimmer. The colors can also be blended with other watercolor paint such as tempera or gouache, however, this will also decrease the level of shimmer in the paint. Twinkling H20's can be applied using paint brushes - or can also be applied directly to the rubber stamp and stamped onto paper or cardstock. The pack that was used for this review was kit number 652 and contained the colors garnet, Passion, Gold Dust, Fern, Majestic Blue, and Sunburst, and this was purchased from a local craft store. The paints were used to create backgrounds and to color rubber stamped images. One of the problems of buying kits or packs of paint is that you are 'stuck' with the colors. This pack, however, presented an excellent range of colors, and while 'gold dust' and 'sunburst' may sound as though they could be similar, when used they are distinctively different. Each of the colors is bright and vibrant and blends well. Twinkling H20's were painted on white paper as well as colored cardstock and the colors remained bright. Interesting effects were achieved when applying the paints as a color wash over dark paper and cardstock. Twinkling H20's are simple to use and require no special equipment. The surface of the paint does require moistening prior to use, and the paints are easiest to use when the surface has been moistened and left to stand for a few minutes. Any standard paintbrush can be used and the paints can be applied directly from the pot or after being blended on a plate, piece of plastic or pallet. Being watercolors, clean up is simple! After use, it is just a case of rinsing paintbrushes and other equipment well in water. The colors are heavily pigmented and staining was experienced on paintbrushes; this is not a problem in normal use. Twinkling h20's are excellent paints and are extremely versatile. The colors are bright and the shimmer is a proper 'shimmer' and not a glittery finish, making these paints ideal for a range of projects. The colors in this pack are exceedingly bright and vibrant - to a level that is unusual in watercolor paints. While each pot of paint will go a long way, buying many different colors can work out expensive, therefore take a good look at the colors in a pack and ensure a good mix. Remember that you can blend and mix colors, therefore, the primary colors will give you a wide spectrum. Oyster is a versatile color that can be used to lighten shades, and also can be used as a priming layer to give extra shimmer to a project. This is also useful when painting on a surface that requires more than one layer. The LuminArte website has a lot of information about Twinkling H20's including a gallery.